I've been baking like it's going out of style lately. There's a lot of chocolate-melting happening. This is my kitchen right now. Wanna know what I don't love? Doing the dishes. Dishwashers are useless to a home baker. I mean the machine kinds...the manual labour kind is totally welcome! PS - I need new oven mits. 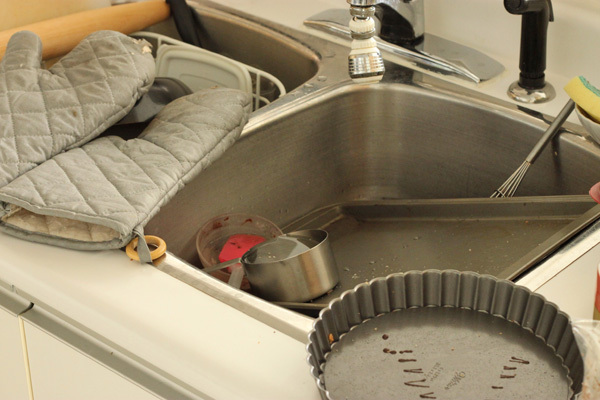 Putting my springform pans, french tart pans, baking trays, muffin pans and measuring cups in the dish washer is not an option for me. They're too precious. I guess I'm saying that my hands and lower back are not as important to me as my baking tools are. Ouch. 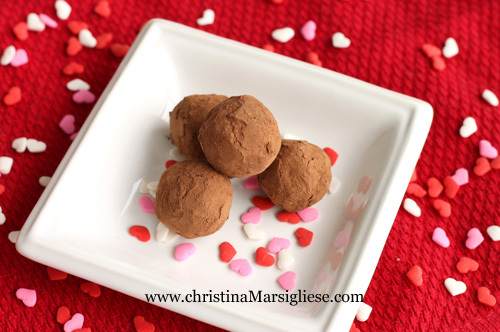 Dark Chocolate Truffles and I dressed them up for your Valentine. They're the most incredibly delicious things you could ever make with only 3 ingredients. I'm not kidding. Only 3 ingredients. I bet you have some bittersweet chocolate in your pantry. If not now, then perhaps after Valentines' Day you will. My mom always gave me chocolate on V-Day. My mom's a sweetheart. Bittersweet chocolate has a minimum of 70% cocoa solids...and cocoa solids refers to the ground up and defatted cocoa nibs that grow from the cocoa tree (Theobroma cacao). You might have some 35% whipping cream in your fridge. No? If you don't then I bet you're low on milk anyway. So, when you run out to the store to get milk, grab some cream while you're at it. Please, thanks! And if you have chocolate, then you probably have some cocoa powder too. So, good. We're all set. All you need to make truffles is ganache. What the heck is ganache? It sounds like some sort of monster. Wellllllllll......ganache is an emulsion of cream and chocolate. There's actually quite a bit of science that goes into it. The cream lowers the melting point of the chocolate so that it is lusciously silky and smooth at room temperature - it's probably the most remarkable texture on the planet. If you've ever had ganache turn gritty, grainy or separate on you, then you can learn why here. Bring cream to a boil in a small saucepot over medium-low heat and pour immediately over chopped chocolate. Let stand 5 minutes. Stir gently with a rubber spatula, starting in the center and working your way out to the edges until completely melted, smooth and glossy. Pour mixture into a shallow glass baking dish and let it stand at room temperature about 30 minutes. Refrigerate until firm and use a melon baller to scoop teaspoons of ganache into balls. 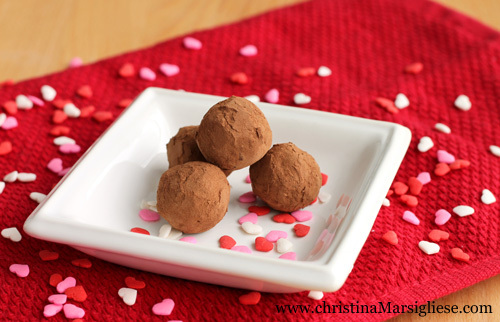 Roll balls in cocoa powder to coat and keep refrigerated until ready to serve. These truffles are super soft at room temperature, so they're best served cold or cool! Good luck eating just one. Those look SOOOO good.... Beautiful Pictures too! this is excellent-- a perfect recipe for a valentine' day gift. one question: how many melon ball-sized truffles will i get from the recipe? thank you! @mari Hi Mari! You should get about 40 truffles from this recipe. If you're giving them as gifts, you can roll the balls in melted chocolate before rolling them in cocoa powder so that they wont be as soft to the touch. They'll be more durable that way. i just made the truffles-- they are SO good. can't wait to think of a clever way to package them and give them to my valentine tomorrow. thank you for the delicious and rewarding recipe! Even though your kitchen is "messy" it's a nice messy. 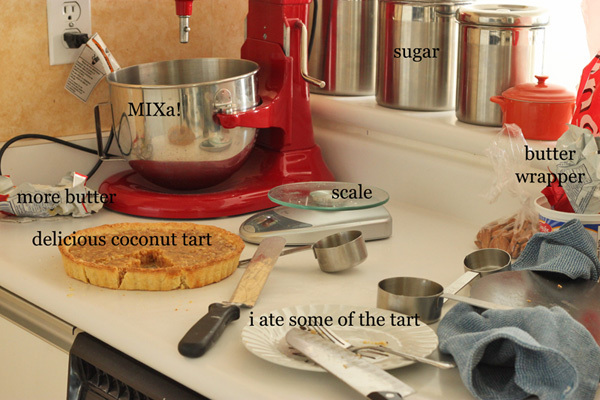 When I bake, there is stuff EVERYWHERE. On the floor, smeared on the cabinets... I agree with you on dishwashers. The good manual kind that will work for desserts are the best! @Leanne @ Healthful Pursuit Oh trust me...there's chocolate on the floor, on the cabinets and on my forehead. At least now I know I'm not the only one! Love your site. I love looking at other people's kitchen tools/bakeware. It is almost as good as the food. How weird is that? One of the best things I have learned is to fill the sink with fresh hot dishwater as part of my mise en place. It seems to cut down on the mess at the end. I try to clear the deck and clean between waiting for the cake/cookies to bake. It cuts down on that big surprise at the end. Oh, and I forgot to mention that purchasing a scale has been the best thing I have done for myself to improve my baking. Who knew? I now think if you are really interested in baking it is the best thing you can do for yourself.